Welcome, Welcome! My name is Megan and I have a gastric band. Throughout my journey being banded, I started to notice something was missing. I had great support from friends and family, but I didn't have many resources when it came to food and cooking. I am a mother of two young girls and a wife of an awesome guy who is banded as well. I am not the greatest cook, but I am starting to really enjoy it. I have a hard time finding band-friendly recipes. I would dig through countless forums, cooking sites and books for recipes. But, I never found what I was quite looking for. I wanted recipes by bandsters. I want to know what everyone else is eating and the products they love. 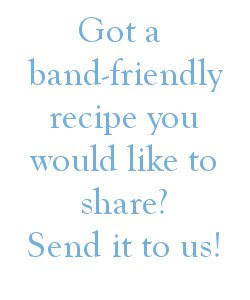 So, welcome to Band Friendly Recipes, a collection of recipes by Bandsters for Bandsters. Hi Megan! I had Lap-band surgery in July 2009. I have been looking for a site like yours! My interests are finding band-friendly, frugal, kid-friendly, quick, and healthy meals. I can't wait to try out your recipes! I have my own blog if you'd like to stop by: http://lapbandlife4me.blogspot.com/. Does anyone else have this same symptom/problem? When one has eaten something which sticks in the band and blocks the passage my nose starts to run. Its weird but what is the connection between the nose and the stomach? One person once suggested that its the body trying to lubricate the blockage to allow it through???? What does bandster portions mean?? Can you keep posting?! I just found this site and I am dying to see more! COME BACK!!! :) You are an inspiration!!! Hi Megan! I love your blog! Ive been banded since june 14 2014 and so far I have lost 27lbs. I have been following some of your recipes and they sure are yummy! You are a great inspiration and keep up the good work! Megan, I'm planning on getting my band on December 11, 2014 so I'm searching for sites like yours. I liked the recipe for the Zucchini Meat Loaf but one of the ingredients is listed as "¼ nonfat milk". Is that 1/4 tbsp or 1/4 cup or what?